January 4, 2015 - The nation’s airlines could realize more than $250 billion dollars in savings in the near future thanks to green-related technologies developed and refined by NASA’s aeronautics researchers during the past six years. These new technologies, developed under the purview of NASA’s Environmentally Responsible Aviation (ERA) project, could cut airline fuel use in half, pollution by 75 percent and noise to nearly one-eighth of today’s levels. Created in 2009 and completed in 2015, ERA’s mission was to explore and document the feasibility, benefits and technical risk of inventive vehicle concepts and enabling technologies that would reduce aviation’s impact on the environment. Researchers with NASA's Environmentally Responsible Aviation project coordinated wind-tunnel tests of an Active Flow Control system -- tiny jets installed on a full-size aircraft vertical tail that blow air -- to prove they would provide enough side force and stability that it might someday be possible to design smaller vertical tails that would reduce drag and save fuel. Project researchers focused on eight major integrated technology demonstrations falling into three categories – airframe technology, propulsion technology and vehicle systems integration. By the time ERA officially concluded its six-year run, NASA had invested more than $400 million, with another $250 million in-kind resources invested by industry partners who were involved in ERA from the start. - Tiny embedded nozzles blowing air over the surface of an airplane’s vertical tail fin showed that future aircraft could safely be designed with smaller tails, reducing weight and drag. This technology was tested using Boeing’s ecoDemonstrator 757 flying laboratory. Also flown was a test of surface coatings designed to minimize drag caused by bug residue building up on the wing’s leading edge. - NASA developed a new process for stitching together large sections of lightweight composite materials to create damage-tolerant structures that could be used in building uniquely shaped future aircraft that weighed as much as 20 percent less than a similar all-metal aircraft. 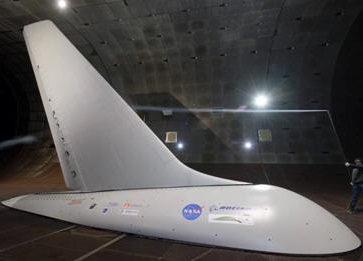 - Teaming with the Air Force Research Laboratory and FlexSys Inc. of Ann Arbor, Michigan, NASA successfully tested a radical new morphing wing technology that allows an aircraft to seamlessly extend its flaps, leaving no drag-inducing, noise-enhancing gaps for air to flow through. FlexSys and Aviation Partners of Seattle already have announced plans to commercialize this technology. - NASA worked with General Electric to refine the design of the compressor stage of a turbine engine to improve its aerodynamic efficiency and, after testing, realized that future engines employing this technology could save 2.5 percent in fuel burn. - The agency worked with Pratt & Whitney on the company’s geared turbofan jet engine to mature an advanced fan design to improve propulsion efficiency and reduce noise. If introduced on the next-generation engine, the technology could reduce fuel burn by 15 percent and significantly reduce noise. - NASA also worked with Pratt & Whitney on an improved design for a jet engine combustor, the chamber in which fuel is burned, in an attempt to reduce the amount of nitrogen oxides produced. While the goal was to reduce generated pollution by 75 percent, tests of the new design showed reductions closer to 80 percent. - New design tools were developed to aid engineers in reducing noise from deployed wing flaps and landing gear during takeoffs and landings. Information from a successful wind-tunnel campaign, combined with baseline flight tests, were joined together for the first time to create computer-based simulations that could help mature future designs. - Significant studies were performed on a hybrid wing body concept in which the wings join the fuselage in a continuous, seamless line and the jet engines are mounted on top of the airplane in the rear. Research included wind-tunnel runs to test how well the aircraft would operate at low speeds and to find the optimal engine placement, while also minimizing fuel burn and reducing noise. As part of the closeout work for the ERA project, information and results regarding each of these technology demonstrations were categorized and stored for future access and use by the aerospace industry, and will be discussed at the American Institute of Aeronautics and Astronautics Sci-Tech Conference in San Diego this week.